Sports Almanac! Jaws 19! Café 80s! It's the sequel that gave us a dystopian timeline of both epic and comedic proportions, as Doc Brown took Marty McFly to the future. It's got an upside down Crispin Glover lookalike, an eerily familiar orange haired casino loving narcissist, and the hover boards every kid has coveted since 1989. Today, we look at 10 things you never knew about Back to the Future 2. It's quite well known that Back to the Future 2 and Back to the Future 3 were shot back-to-back, in what was then a stunning move for a major studio. But while we think of the films as a trilogy now, a second Back to the Future wasn't always a given. From 1985 to 1955 and back again, Back to the Future works fantastically as a standalone story, sending Marty back to a present even better than he'd left it. Sure, there's that fun little cliffhanger, but director/creator Robert Zemeckis and cowriter/producer Bob Gale have said that last scene was something they put in just for fun. The words "To Be Continued" weren't in the theatrical version. (Yes, even if you know somebody who swears they saw "To Be Continued" in the theater, just like the folks who swear they saw Sinbad in a genie movie, it never actually happened.) "To Be Continued" was added in the home video release. The first film was so successful that the studio planned to move forward with or without the original team. 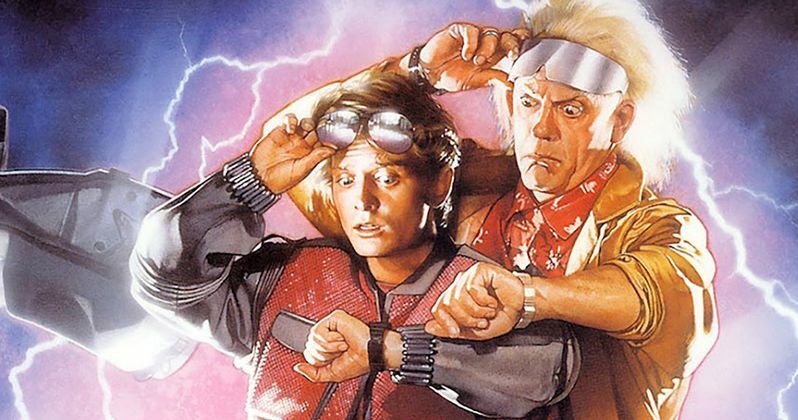 Thankfully, Zemeckis and Gale agreed to return to make not one but two Back to the Future sequels. Marty was nearly a draft dodger. In early drafts of Back to the Future 2, Marty travels back to 1967. As the Vietnam War divides the country, Marty is arrested because he doesn't have a draft card. Hey, he could have joined the Navy or the Coast Guard. We know he had the jacket for it. Crispin Glover made peace with Robert Zemeckis. The original Back to the Future had one of the most amazing ensemble casts of the 80s. But the sequel wasn't exactly smooth sailing. In probably the best-known trivia surrounding Back to the Future 2, Crispin Glover didn't appear in the sequels, and he successfully sued after another actor was made to look like him with the use of prosthetics, hats, sunglasses, and camera angles. It's one thing to recast a role, as they did with Marty's girlfriend Jennifer when Claudia Wells left the franchise to care for her ailing mother. But this was something different. Glover also sued because he wasn't paid for the reuse of footage with him in it, which resulted in new Screen Actors Guild rules designed to protect against this. What's perhaps lesser known is that Glover and Zemeckis made up. Glover played Grendel in the director's 2007 3D mo tion-capture fantasy movie, Beowulf. No, Back to the Future 2 didn't accurately predict the World Series. While we're dispelling myths, no, Back to the Future 2 didn't predict the Florida Marlins would win the 1997 World Series, or the Cubs would win in 2016. After all, Back to the Future 2 takes place in 2015. Speaking of which, whatever day it is today, is not the day Marty traveled to. October 21, 2015, is the actual day. To the film's credit, among the many Back to the Future Easter eggs, it did predict that Florida would have a Major League team (one represented by a gator, not a marlin) and as a nod to producer Bob Gale's long-suffering fandom, that the Cubs may in fact someday return to the World Series. The Cubs won the World Series in 2016, over a century since their last World Series win. It did predict Pepsi Perfect (sorta). "Hey, give me a Pepsi Free!" Pepsi Free was a real thing in 1985. PepsiCo has changed the designs, shapes, and available variations of their trademarked soda over the years. By the time Marty gets to 2015, he knows better than to ask for a Tab or a Pepsi Free. Like the guy from Suicidal Tendencies, all he wanted was a Pepsi. What emerges, of course, is a Pepsi Perfect. To commemorate Back to the Future day in real life October, 2015, Pepsi actually released a limited edition Pepsi Perfect. It's like one of those classic time-travel conundrums brought to life - if John Connor didn't send Kyle Reese back in time, John Connor would have never been born. But if he hadn't been born, he could have never sent his father back in time... It's heavy.